A curious correlation between the mass of a galaxy’s central black hole and the velocity of stars in a vast, roughly spherical structure known as its bulge has puzzled astronomers for years. An international team led by Francesco Tombesi at NASA’s Goddard Space Flight Center in Greenbelt, Md., now has identified a new type of black-hole-driven outflow that appears to be both powerful enough and common enough to explain this link. The supermassive black holes in active galaxies can produce narrow particle jets (orange) and wider streams of gas (blue-gray) known as ultra-fast outflows, which are powerful enough to regulate both star formation in the wider galaxy and the growth of the black hole. Inset: A close-up of the black hole and its accretion disk. Most big galaxies contain a central black hole weighing millions of times the sun’s mass, but galaxies hosting more massive black holes also possess bulges that contain, on average, faster-moving stars. This link suggested some sort of feedback mechanism between a galaxy’s black hole and its star-formation processes. Yet there was no adequate explanation for how a monster black hole’s activity, which strongly affects a region several times larger than our solar system, could influence a galaxy’s bulge, which encompasses regions roughly a million times larger. “This was a real conundrum. 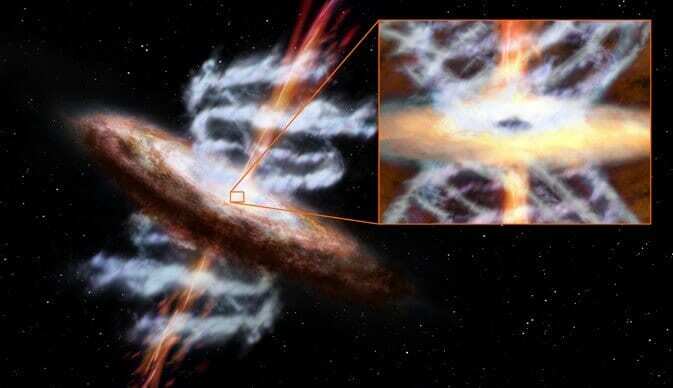 Everything was pointing to supermassive black holes as somehow driving this connection, but only now are we beginning to understand how they do it,” Tombesi said. Active black holes acquire their power by gradually accreting — or “feeding” on — million-degree gas stored in a vast surrounding disk. This hot disk lies within a corona of energetic particles, and while both are strong X-ray sources, this emission cannot account for galaxy-wide properties. Near the inner edge of the disk, a fraction of the matter orbiting a black hole often is redirected into an outward particle jet. Although these jets can hurl matter at half the speed of light, computer simulations show that they remain narrow and deposit most of their energy far beyond the galaxy’s star-forming regions. Astronomers suspected they were missing something. Over the last decade, evidence for a new type of black-hole-driven outflow has emerged. At the centers of some active galaxies, X-ray observations at wavelengths corresponding to those of fluorescent iron show that this radiation is being absorbed. This means that clouds of cooler gas must lie in front of the X-ray source. What’s more, these absorbed spectral lines are displaced from their normal positions to shorter wavelengths — that is, blueshifted, which indicates that the clouds are moving toward us. In two previously published studies, Tombesi and his colleagues showed that these clouds represented a distinct type of outflow. In the latest study, which appears in the Feb. 27 issue of Monthly Notices of the Royal Astronomical Society, the researchers targeted 42 nearby active galaxies using the European Space Agency’s XMM-Newton satellite to hone in on the location and properties of these so-called “ultra-fast outflows” — or UFOs, for short. The galaxies, which were selected from the All-Sky Slew Survey Catalog produced by NASA’s Rossi X-ray Timing Explorer satellite, were all located less than 1.3 billion light-years away. The outflows turned up in 40 percent of the sample, which suggests that they’re common features of black-hole-powered galaxies. On average, the distance between the clouds and the central black hole is less than one-tenth of a light-year. Their average velocity is about 14 percent the speed of light, or about 94 million mph, and the team estimates that the amount of matter required to sustain the outflow is close to one solar mass per year — comparable to the accretion rate of these black holes. “Although slower than particle jets, UFOs possess much faster speeds than other types of galactic outflows, which makes them much more powerful,” Tombesi explained. By removing mass that would otherwise fall into a supermassive black hole, ultra-fast outflows may put the brakes on its growth. At the same time, UFOs may strip gas from star-forming regions in the galaxy’s bulge, slowing or even shutting down star formation there by sweeping away the gas clouds that represent the raw material for new stars. Such a scenario would naturally explain the observed connection between an active galaxy’s black hole and its bulge stars. Tombesi and his team anticipate significant improvement in understanding the role of ultra-fast outflows with the launch of the Japan-led Astro-H X-ray telescope, currently scheduled for 2014. In the meantime, he intends to focus on determining the detailed physical mechanisms that give rise to UFOs, an important element in understanding the bigger picture of how active galaxies form, develop and grow.